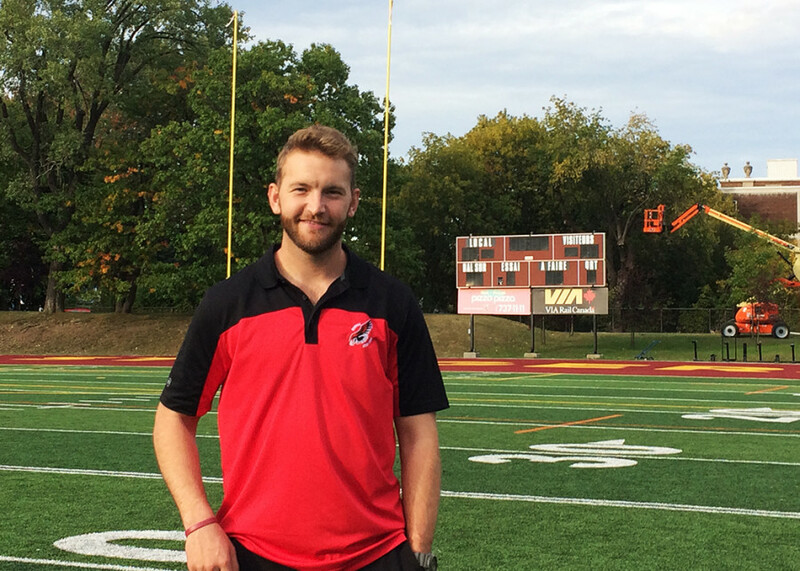 He may be the most recognizable high school coach in Quebec, but former Montreal Alouettes quarterback Tanner Marsh doesn’t want to be described that way—he’s here to develop quarterbacks. Not so long ago, Marsh threw the pigskin for the Montreal Alouettes at Percival Molson Memorial Stadium. The team released him in 2015 after two seasons but he has not moved on from Montreal completely. This city is where he met his girlfriend and they just moved into an apartment together last week. Marsh calls Montreal home now too because he trains quarterbacks for the Dorval-Jean XXIII Faucons, a volunteer gig he started three weeks ago when the team was looking for coaches. Despite being situated in Montreal’s mostly English-speaking West Island, Dorval-Jean XXIII, is a French high school. “He’s a guy that’s not afraid of a challenge, not afraid of new things,” said Dean Norsworthy, one of his former coaches. After a game between the Faucons and the Loyola High School Warriors at Concordia stadium on the university’s Loyola campus, Marsh insisted that becoming a coach is not what led a Texas-born quarterback to be on the sideline of a high school football game in Quebec. His main goal, the 26-year-old said, is “to build the quarterback position.” Only one quarterback from Quebec has ever played for a Canadian Football League team, according to sonahrsports.com, but that was 34 years ago. Marsh believes quarterbacks in the province have a lot of potential but there is no one to help them out. When Marsh goes back to Russellville, Arkansas where he studied, he too has someone to help him out. Norsworthy, Marsh’s former quarterback coach and offensive coordinator at Arkansas Tech University, still has a big influence on him. At least once a week, Norsworthy and Marsh talk football and life on the phone. When Marsh trains his quarterbacks, he thinks about how Norsworthy would do it. Norsworthy has known Marsh since his high school days. At the time, he had scouted the young Marsh and offered him to join a university in Oklahoma where he was coaching. Marsh decided to study in his home state instead, but after three years, countless injuries and no more than backup prospects, he felt he needed to move on. Looking for somewhere where he could compete for the starting quarterback job in 2012, Marsh called Norsworthy at Arkansas Tech University, who was friends with his high school coaches. Norsworthy remembered the call vividly. “[All] I want is a chance to compete and I’ll accept the consequences of whatever happens,” Norsworthy recalled Marsh saying over the phone. Without a starting quarterback, Norsworthy didn’t hesitate. As soon as he was part of his new team, Marsh spent a lot of hours training in the weight room and studying in the film room. His new coach was impressed by his leadership, his pure talent—Marsh broke school records in his only season—but more importantly, his personality outside the field. “I’ve been very blessed to coach a lot of great athletes but not all great athletes are great people, and he is most certainly a great athlete and a great person,” Norsworthy said. Perhaps it’s the reason why Norsworthy called Marsh “as close a thing as to having a son.” When Norsworthy’s mother died at the end of the football season, Marsh was one of three players to attend the funeral. Following his college football career, Marsh went to an NFL camp with the Indianapolis Colts and the Dallas Cowboys. His path to Montreal was no less eventful, starting with a camp in Dallas that the team organized, then another one in North Carolina, followed by another in Montreal. “I tried for Montreal a lot, through about four different tryouts before I made the team,” said Marsh. As a player for the Alouettes, Marsh had many highs and lows, and no game could better represent his career than the one played at Percival Molson on Aug. 22, 2013. That night, with all-star quarterback Anthony Calvillo injured, Marsh threw four interceptions after taking over for Josh Neiswander, before launching a ball 57 yards with one second remaining, which led to an unlikely Alouettes win. It was “Marsh Madness” in Montreal, as some media labeled it. And unsurprisingly, Norsworthy was watching that day. “I would watch his games, I’d call him and we’d go through his plays and he’d explain to me what his progressions were, what he was thinking in certain situations,” explained Norsworthy. Usually, after his football seasons, Marsh would go back to Russellville, stay with his former coach and help out kids at the high school where Norsworthy also worked. In this vein, Marsh would like to open a camp to train quarterbacks in the province. He had already told Gonzales about wanting to open a facility or performance centre in the past. Marsh has moved around quite a bit in recent years, training and “throwing balls” in many states, but now is his chance to settle down. “Being in Montreal has really helped Tanner grow as a person, not just professionally, but also emotionally and mentally,” Norsworthy said. Norsworthy, who played or coached in “every [southern] state just about,” knows a little bit about change. “Change is scary until you embrace it, and then when once you embrace it, change creates growth,” the coach said.